Milton’s 5 piece G-Style couplers, plugs and reducer kit are the highest SCFM rated and are used in applications that require over 60 SCFM. 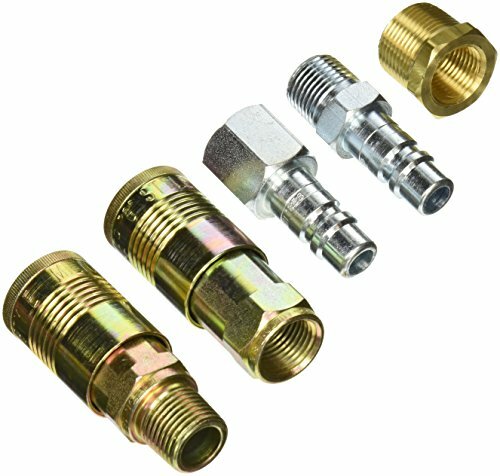 These 1/2" Male and Female NPT G-style plugs offer 2 different sizes (.125 or .375 critical profile dimension tip sizes) which can function with both 1/2” Male and Female G-style coupler. This kit has a 1/2" basic flow size, with a maximum air flow of 99 standard cubic feet per minute and 300 PSI max inlet pressure. Made of durable steel, plated to resist rust. The kit also includes a 3/4” MNPT x 1/2” FNPT Hose reducer bushing to provide you the ability to assemble a new air hose or replace old fittings when reduction in pipe size is required.